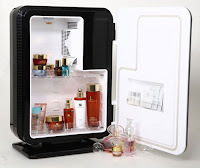 Store your perfume and skincare in the fridge! Germs will multiply faster if you keep your skincare in sunlight, so pop them in the fridge to maximise the benefits. It also helps to cool the skin in summer.